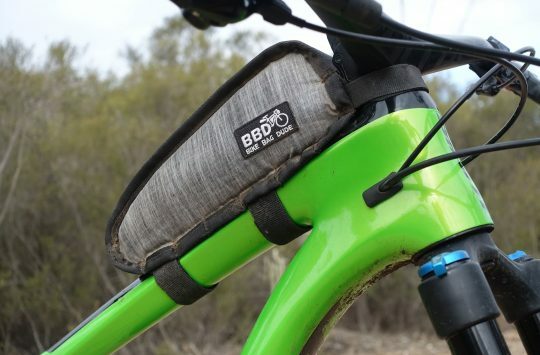 Is Ortlieb’s new Atrack BP bag the answer to bikepacking on a full suspension bike? Not everyone can fit bikepacking bags to their bike. There are some awkward frame designs out there and not everyone has got the room. Some people don’t want to either. 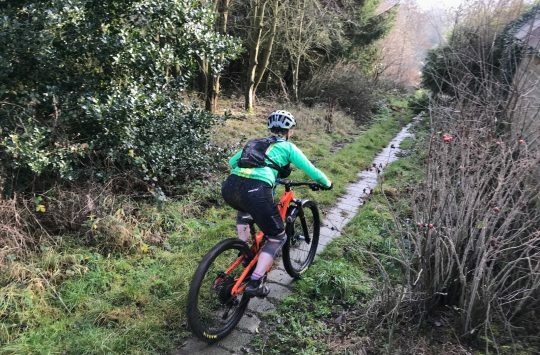 The fact is, strapping a load of bulk to any bike is going to affect the handling and while the effect of saddle packs and frame packs can be minimised, not everyone is going to be keen. Big seat packs don’t always play nice with dropper seatposts and full suspension frames either. There’s still a market out there for big rucksacks to carry most, or even all your gear. Get a good pack and load it sensibly and it can work well. All the essentials, and some extras. 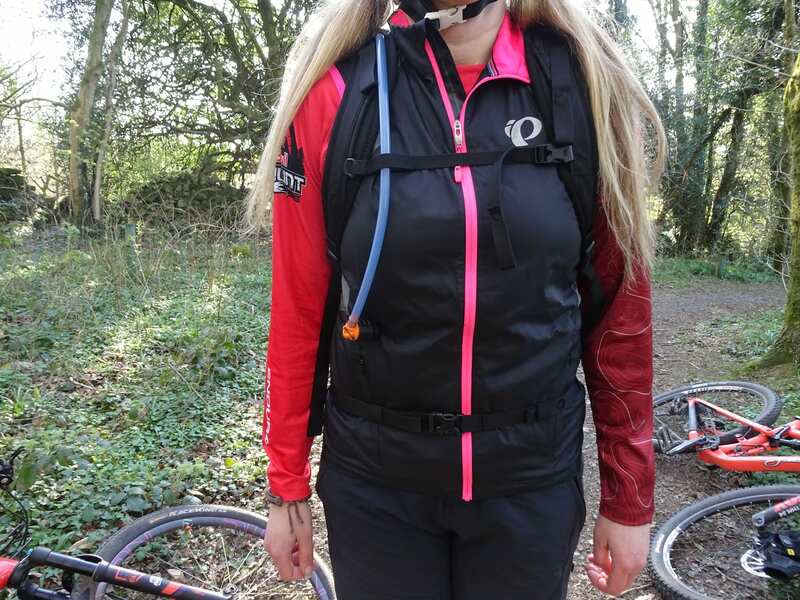 The Ortlieb Atrack BP (BP stands for ‘bikepacking’, unsurprisingly) is an evolution of the existing Atrack – this BP model has lost a small amount of weight. In addition, the hip fins – which used to extend around the waist and get in the way if you were leaning forward on a bike – have been swapped for pads that just rest on your lower back. 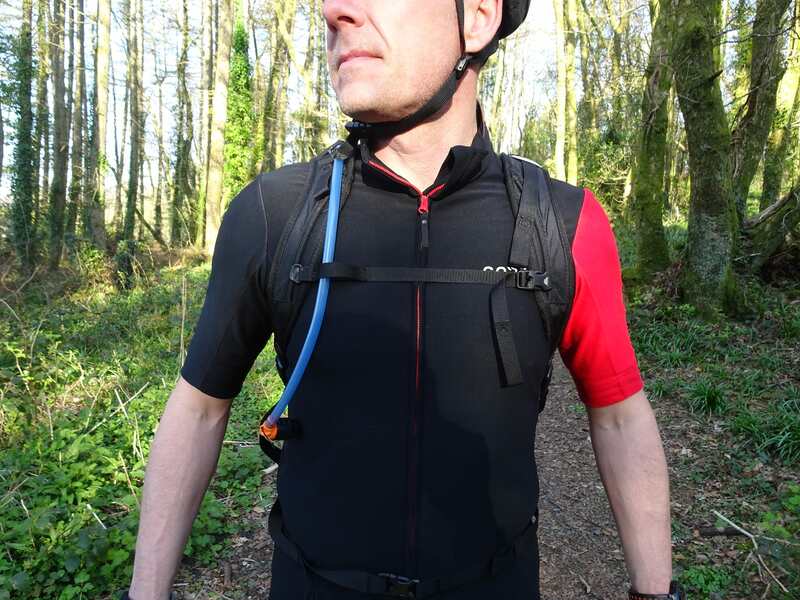 There’s a helmet toggle on the back of the pack which comes in handier than you might think it would, and there’s provision for an insulated hydration bladder. 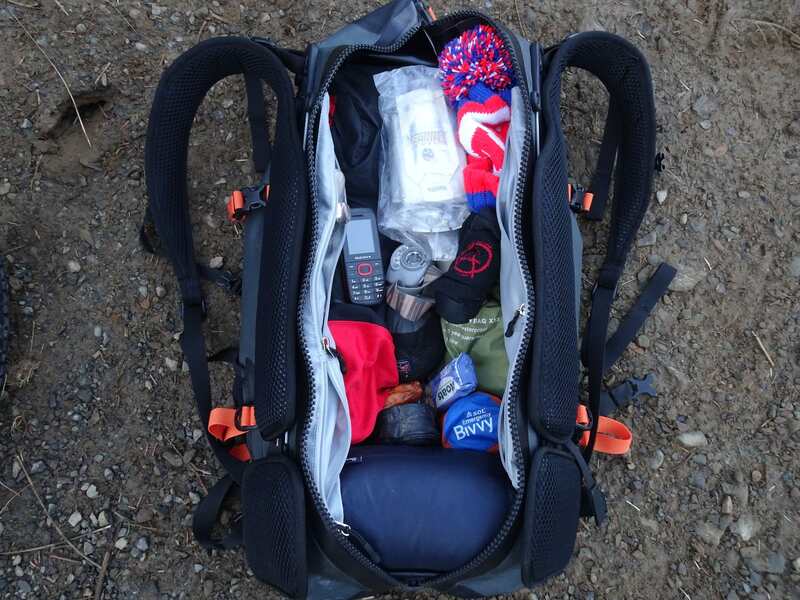 The best part though is that you can lie the pack down and unzip it all the way from top to bottom, so access to all your stuff is about as easy as it gets. Just pull the zip, pull the sides apart and there’s all of your stuff. 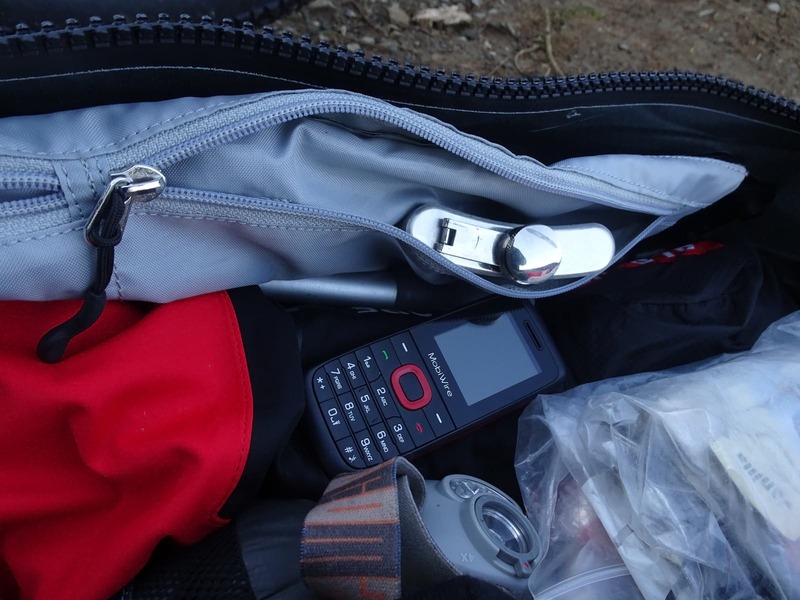 No more unpacking the bag and laying all your kit out on the ground in the dark to get to your spare undercrackers. Genius! Oh, and it’s completely waterproof. I know, that’s two best bits. As is the case with all Ortlieb bags, waterproof means completely waterproof and submersible without anything inside getting wet. Handy for people who live in places that seem to be perpetually wet or those people who tend to fall in canals. 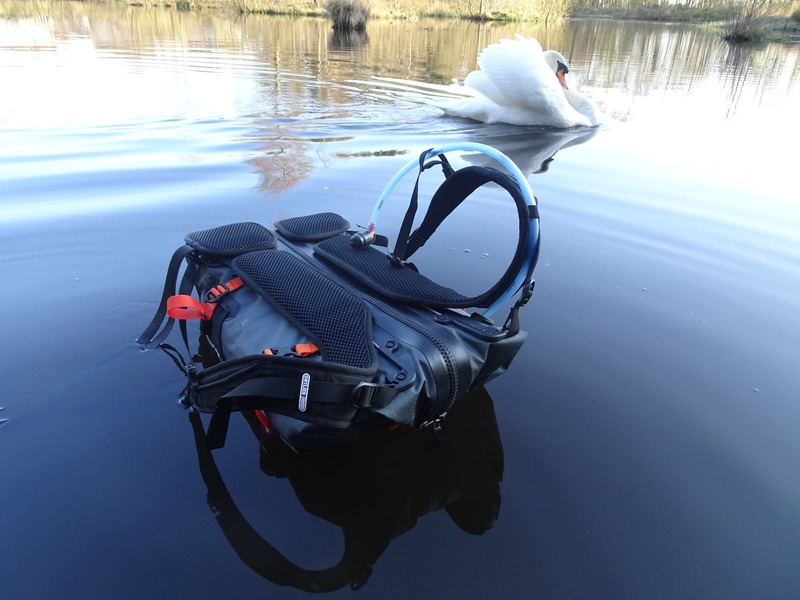 It’s fully-submersible for 30 minutes too (IP67 compliant, waterproofing nerds), just in case you like the canal after you’ve fallen into it. The bonded material of the Atrack is ‘high frequency welded’ which means it there are no stitches or glue that might give way and eventually let moisture get in. 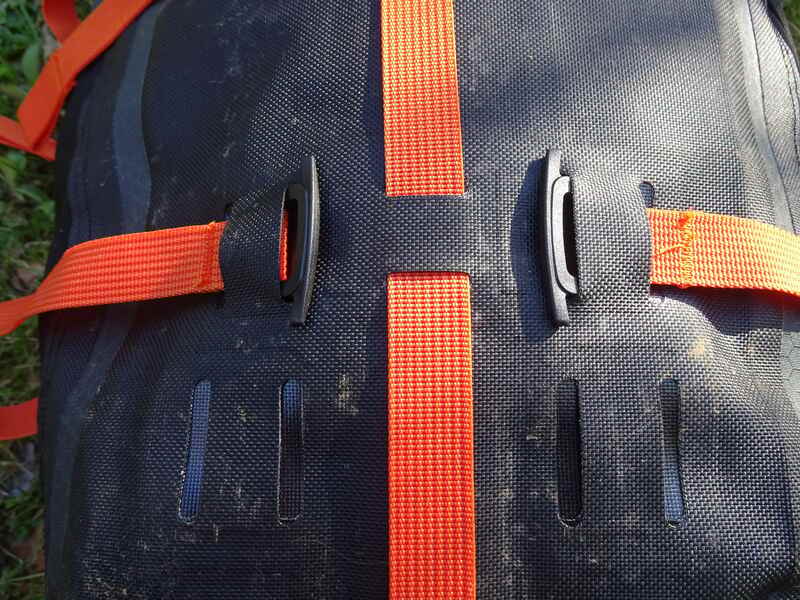 The outer ‘skin’ of the pack has various slots into which the nylon straps are threaded, held in place with hard plastic toggles and pull-tight buckles. 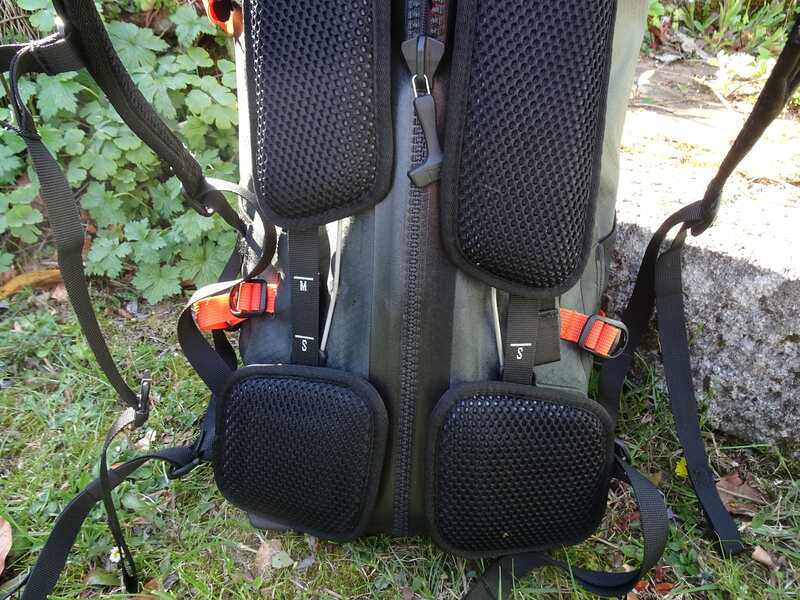 The straps provide a means of stabilising the pack’s contents and to allow bulky things such as walking poles, skateboards and joints of ham to be carried on the outside. 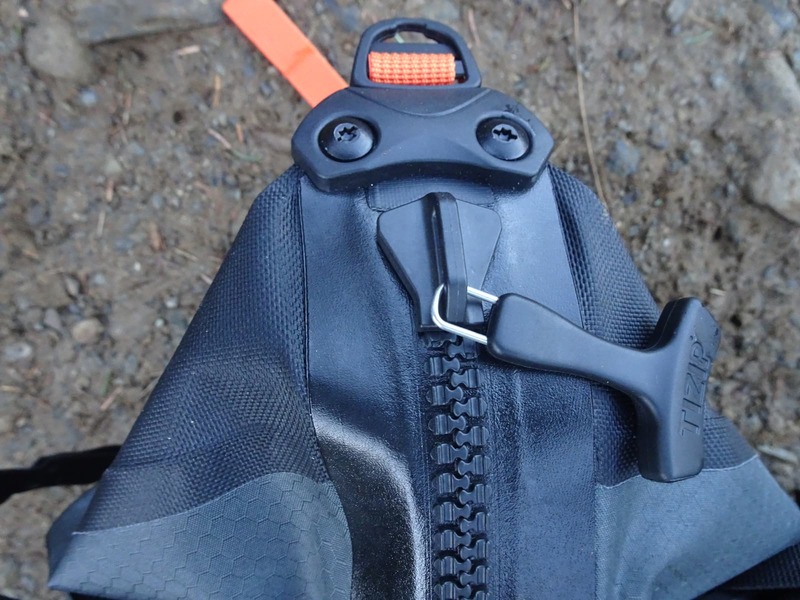 Opening and closing the HUGE and tough-looking zip (seriously you don’t want any of your soft tissue getting caught in this zip) takes a moderate amount of effort – it’s any waterproof bag’s major weak-spot so it needs to be something special. So special in fact that there’s a separate instruction manual just for ‘operating the zip’. Just make sure it’s pulled up all the way to its little parking space thing and it’s fine. The zip comes with a manual. Small inner pockets, for things with rounded edges. Inside it’s quite simple – there are four lightweight nylon zipped pockets for small items, two on each side of the zip. They’re not really for anything sharp or pointy though – while the pack seems nice and tough the internal pockets are only really designed for light and/or non-pointy things. There’s a strap for tying things down and there’s a long strap with a carabiner, presumably for your keys. 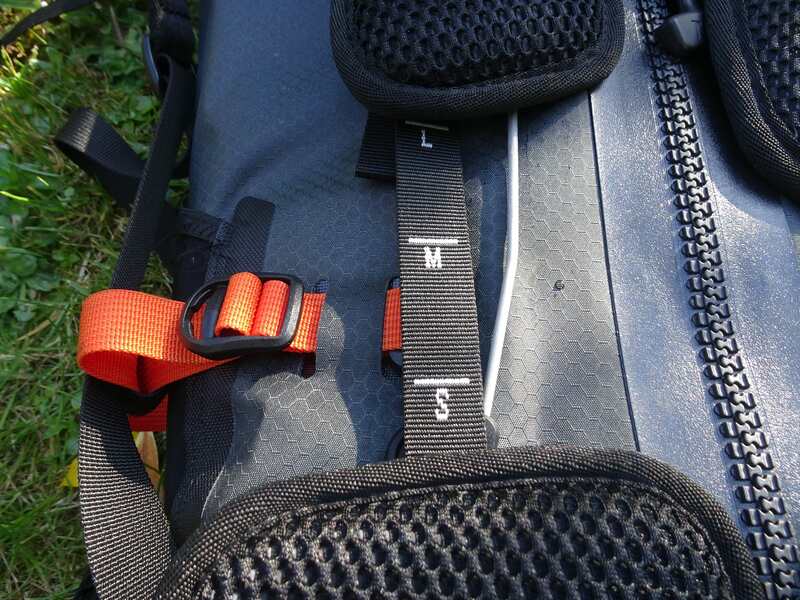 Adjustment is really clever – the back pads slide up and down on independent rails, with markers for small, medium and large on the straps that tie the pads in place. It’s worth experimenting with these as I found that the pack could either tap on the back of my helmet (annoying) or snag on it (really annoying). It’s a big pack designed for carrying a lot of stuff but I found the perfect fit after a couple of goes. At 25 litres the Atrack BP isn’t in ‘kitchen sink’ territory and nor should it be. 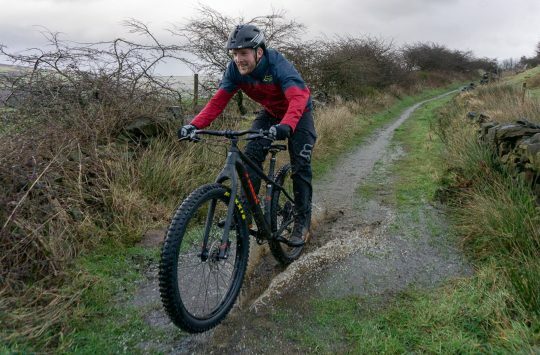 Bikepacking should be about travelling light and remember, the bigger your bag, the more stuff you’re inclined to take. 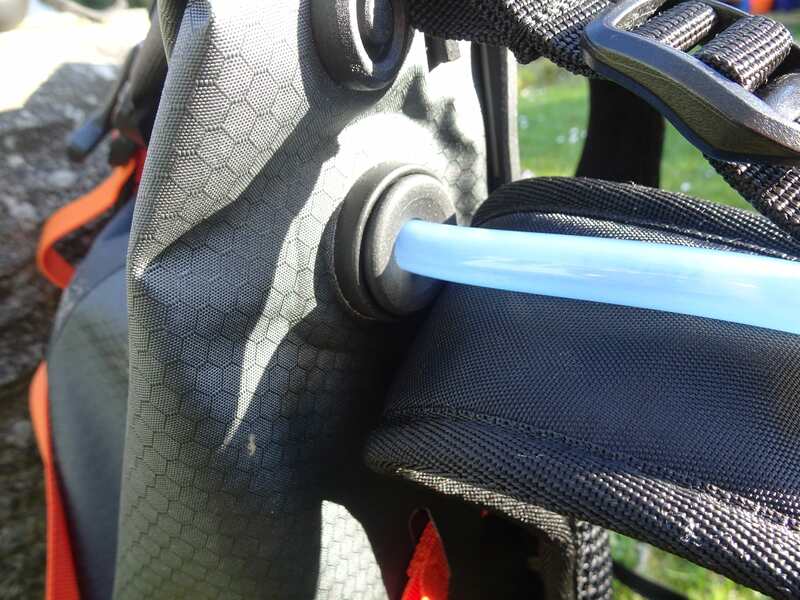 There are two additional, non-waterproof mesh pockets on the outside for bottles or anything else you don’t mind getting wet and want to keep handy.